Is your organization looking for strategies to promote its products or services to the Madison-area Human Resources community? 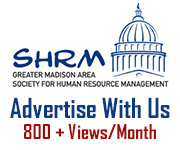 Consider the opportunity to reach out to area HR professionals through the Greater Madison Area Society for Human Resource Management (GMA SHRM)! The GMA SHRM chapter is one of the largest in the United States. By partnering with GMA SHRM, you will have a year-long opportunity to reach out to over 800 HR professionals representing more than 500 employers. In 2018 GMA SHRM drew record attendance at its bi-monthly Professional Development Summits and annual Human Capital Conference with over 800 combined attendees! GMA SHRM offers year long and individual marketing options based on your budget, timing and the audience you would like to reach. Follow a link below for full program information or on a specific marketing or advertising option. GMA SHRM Corporate Partner Program - a calendar year program giving year around presence, discounts and benefits. Human Capital Conference - our largest event of the year attracting 250 HR professionals for a full day of education and networking. We are currently offering Corporate Partnerships for 2019. There are Platinum, Gold, Silver and Bronze Partnership levels to suit your budget. In 2018 GMA SHRM drew record attendance at its bi-monthly Professional Development Summits and annual Human Captial Conference with over 800 combined attendees! Be a part of the succes for one of the most respected SHRM Chapters in the nation! Click here to see the full benefits of becoming a Corporate Partner. Sign up now through December 11th to secure your spot! Contact us for Corporate Partnership information. 2019 will mark the 14th Year of our Annual Human Capital Conference! The conference is scheduled for Tuesday, May 14, 2019. Sponsorship of the conference provides you with the opportunity to highlight your company to over 250 Human Resources Professionals from the Madison area. This year we have two different levels of sponsorship, Business Sponsor and Premier Sponsor. Spaces are limited and will be provided on a first come basis. * Commitment must be received by January 31st to guarantee placement on these promotions. GMASHRM offers a variety of advertising opportunities throughout the year, though they are limited and early application is advised. Click here to download the advertising application form. Our online e-newsletter, HR InTouch, is distributed to our 700+ members monthly and past issues are archived on our website. A maximum of three ads may appear in any issue [ST1] (first-come, first-served with preferential treatment to Corporate Partners). Non-partner ads will appear below the list of Corporate Partners. InTouch ads are $200 per issue for members, and $325 per issue for non-members. Upon acceptance of your application, we will require your payment and ad artwork be submitted by the 15th of the month prior to your assigned issue. The 3.75” x 5” ad may be a jpg or pdf. Ads may be full color. Members receive an E-Blast (e-mail communication) on a regular basis (as necessary; typically, once per week). This communication is purposefully brief and highlights only the most important and time-sensitive information our members need (reminders of upcoming meetings, registration deadlines, breaking news that affects our association or profession). Dimensions are 180 pixels wide x 150 pixels high and 72 DPI. Must be in .jpg format and cannot exceed 50kb in size. URL/Weblink included. E-Blast Sponsorship costs $400 for members, and $525 for non-members. You will be featured in four consecutive E-Blasts over an approximate 4-6 week period. Your image may not be altered within an advertising period (4 consecutive E-Blasts). One-time use of mailing information is $250 for GMA SHRM members and $400 for non-members. A signed contract outlining permitted use of the membership information will be required. Mention on registration page and on email announcements of meeting. *Sponsorship of Professional Development Summit Sessions is only available if not utilized by Gold Corporate Partners.